Automatic cat litter boxes are made to make our lives easier. There are several types of them, like most popular ones, self cleaning boxes with combs to scoop the wastes or flushing ones that use permanent litter, which is washable. Automatization of our life, however, doesn’t come free. 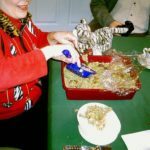 There are several disadvantages of it, and this review will help you to make the decision, whether you want an automatic litter box, or will stick to a regular one. Ease of usage. Self cleaning boxes are really easy to use. Actually, this is the only advantage of automatic litter boxes, but it certainly is what it’s intended to be and it’s a significant advantage. However, not all models are equal and some work better, some worse. If you are after a good one, read user reviews for a specific model. Also, while not always 100% true, there’s a connection between the quality and price. You may save on a cheap unit, but its combs may get stuck or litter not washed thoroughly. Price. Automatic cat litter boxes do cost a lot. It is probably the drawback in the eyes of the most cat owners. Expenses rise significantly, if you are about to provide more than one box for your cat. Did you know that it’s good to have more boxes than you have cats? Size. There’s a paradox. While we want cat litter boxes take up less space, our cats want them large. In all cases, it’s about finding a compromise. 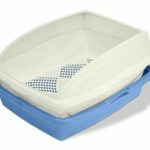 When it comes to self cleaning comb litter boxes, it’s harder to do so, because the mechanisms operating the box take up space, while the “usable” litter surface remains relatively small. Litter type. We honestly do recommend cat owners trying different types of litter themselves, as it helps to find the best solution in every individual case. 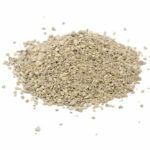 With automatic litter boxes it’s not possible, as they are usually recommended for using with a specific litter type. Most comb litter boxes require silica gel litter, and flushing boxes usually have their own, permanent, washable litter type. Bad if your cat dislikes it, considering the amount of money you spent on the device. Noise. Automatic litter boxes are noisy, and some cats may get scared of it. And the fear is quite common reason for cats not using the box. Even though most models have a workaround, that is, litter box is starting to operate some time (10 to 20 minutes for most) after the cat has visited the litter box, it still does not mean that the cat is not able to hear it. However, don’t be scared, there are many cats who do not pay attention. Connections. Automatic litter boxes need power to operate. So, either it is batteries or an electric plug. Also, many flushing litter boxes require a water connection. 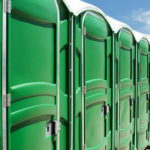 Besides the hassle of changing batteries, or paying electricity bill, it may make fewer possibilities in choosing a perfect location for your litter box. In many cases, changing the location would be one of advices by a behavior consultant, if some problems occur. 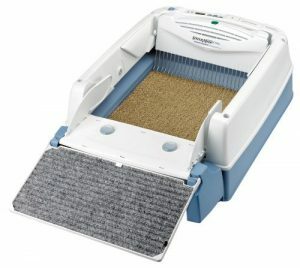 Automatic litter boxes are truly great addition to our busy lives. They certainly do have many disadvantages, however, as you can see above, none of them is a crucial issue, one that would say: “You never use that litter box again”. The only truly large drawback (besides the tiny possibility that your cat is not gonna use it) is that they do cost a lot. Otherwise, we’d recommend you trying it, but spending close to 100+ dollars on a cat litter box just to try & see doesn’t seem like a nice idea to us.